When the rhubarb starts growing, it’s a mad rush to make all the things we can with rhubarb. Because, rhubarb! 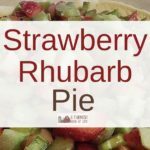 We dive into making Strawberry Rhubarb Pie, Strawberry Rhubarb Slush, Rhubarb Muffins, and this favorite, Sour Cream Rhubarb Cake. 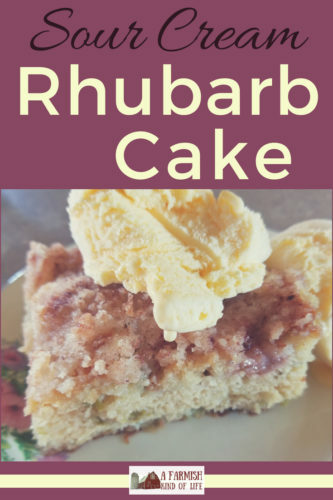 Lots of rhubarb cake recipes have similar ingredients, and use buttermilk, sour milk, or milk as the liquid in the batter. Sour Cream Rhubarb Cake uses—you guessed it—sour cream. 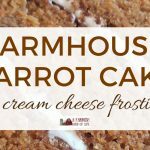 The batter is super thick and amazing and creates a cake that tastes like heaven on the homestead. And it has a streusel topping! It’s tasty any time of day. I can neither confirm nor deny the possibility of my having eaten this for breakfast on more than one occasion. All right Amy, stop yapping and tell us how to make it, will you? In a large bowl, combine 1 cup sugar, the baking soda, salt, and 2 cups of flour. Add the eggs and sour cream, stir until smooth — the batter will be thick! Then fold in the rhubarb.You will be wondering if this is right because there seems to be way more rhubarb than necessary for this thick batter. Just go with it. It’s right. Trust the recipe. 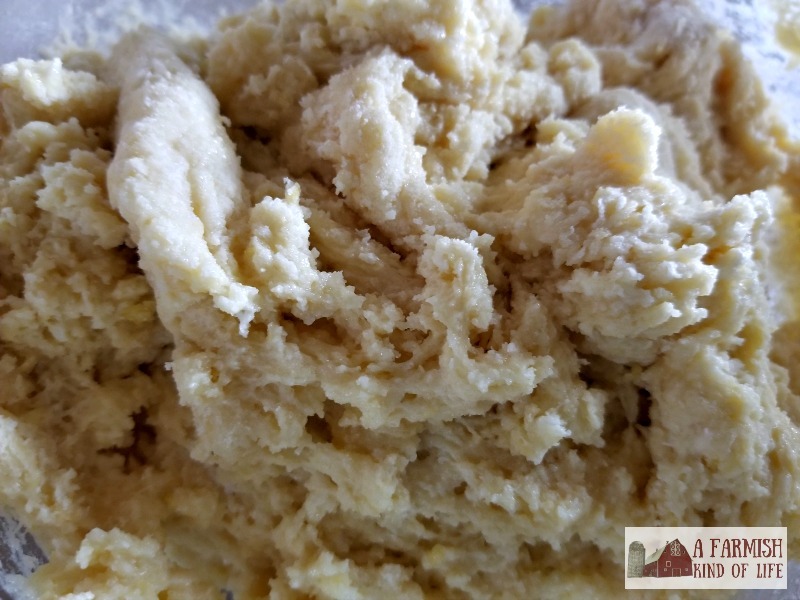 Spread the batter in a greased and floured 9×13 pan. Now it’s time for the topping. 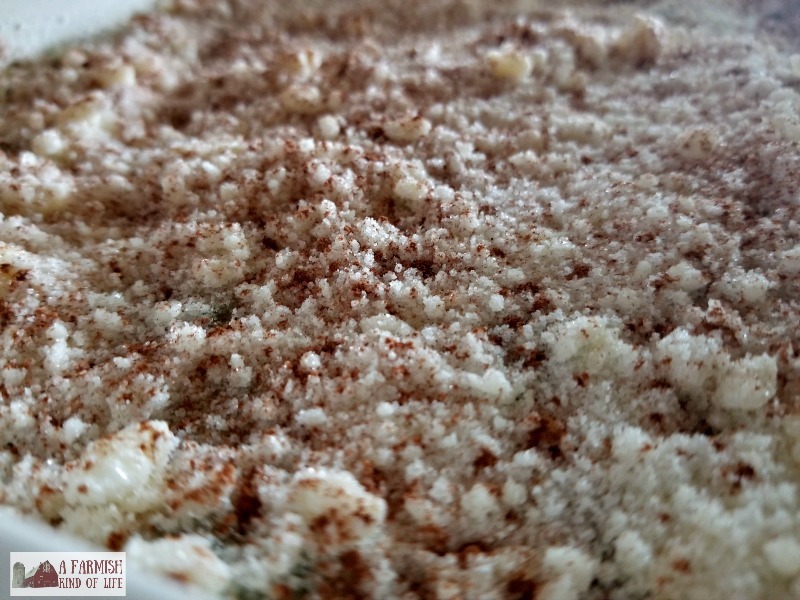 (Streusel topping!) In a small bowl, combine the remaining 1 cup sugar and 1/4 cup flour. Then cut in the butter until well combined. Sprinkle the mixture all over the top of the batter that’s waiting in the pan, then dust cinnamon all over everything. Now we are ready to bake! Bake the cake at 350 for 45-50 minutes. A toothpick inserted in the middle of the cake should come out clean. Sugary, but not battery. 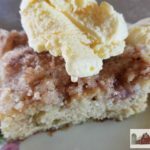 Sour Cream Rhubarb Cake tastes like heaven on the homestead with its thick rhubarby batter and streusel topping. 1. In large bowl, combine the 1 cup sugar, baking soda, salt, and 2 cups flour. 2. Stir in the eggs and sour cream, mix until well combined. Fold in rhubarb. 3. Spread batter evenly in greased and floured 9x13 pan. 4. In small bowl, make topping. Combine remaining 1 cup sugar and 1/4 cup flour, then cut in butter. Sprinkle mixture on top of cake and then dust with cinnamon. 4. Bake at 350 for 45-50 minutes.